And now's the time to break and run away. This is the first year since 1984 when the musicals at the Stratford Festival have been by the same writing team. In 1984 the Festival presented three Gilbert and Sullivan operettas – a new production of Iolanthe along with revivals of The Mikado and The Gondoliers. This year the Festival is presenting two musicals by Rodgers and Hammerstein – The Sound of Music at the Festival Theatre and Carousel at the Avon. This is thus a fine time for fans of musicals to compare the two, but what they will likely find is that Carousel, often touted as the greatest of all American musicals, is in fact much more old-fashioned as a story and actively objectionable in theme. 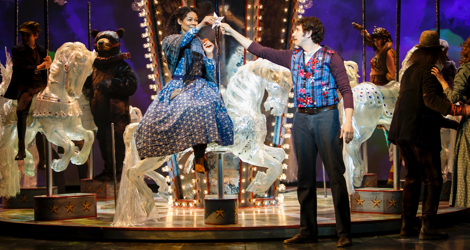 That director Susan H. Schulman has given Carousel such an old-fashioned staging only makes the musical appear more like a bizarre artifact of its time. The musical is based on the 1909 play Liliom by Hungarian author Ferenc Molnár (1878-1952), who also wrote The Play’s the Thing (1926) that Soulpepper has often revived in the past and will revive later this year. Unlike the later play, Liliom is a tragedy, not a comedy. In adapting the play, Hammerstein relocated the action from 1909 Budapest to the Maine coastline in the late 19th century. Except for the ending the story is essentially the same. Carnival barker Billy Bigelow (Jonathan Winsby) loses his job when the jealous carnival owner Mrs. Mullin (Robin Hutton) thinks that Billy flirts too much with the girls on the carousel. He has most recently flirted with cotton mill worker Julie Joran (Alexis Gordon). Although warned by her best friend Carrie (Robin Evan Willis) and by her boss Mr. Bascombe (Keith Dinicol) not to stay out past the curfew for female employees and thus lose her job, Julie chooses to ignore their advice to stay out with Billy. They apparently fall in love, even though they never actually say “I love you” to each other. Realism gives way to fantasy as we see Billy escorted to the back gate of heaven where he is given one more chance on earth to redeem himself. He returns fifteen years later to see his daughter Louise (Jacqueline Burtney), who has become as rebellious and antisocial as Billy used to be. Billy has stolen a star from heaven to give Louise, but when she won’t accept it, he slaps her. In Molnár’s play, Billy’s failure condemns him to hell. 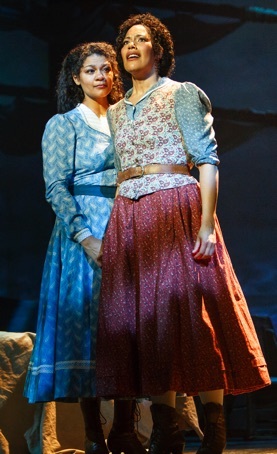 In the musical, the continued love of mother and daughter is enough to get Billy into heaven. As Louise tells her mother: “There was a strange man here, and he hit me hard. I heard the sound of it, Mother, but it didn't hurt. It didn't hurt at all. It was just as if he kissed my hand”. Heaven clearly takes a dim view of Billy’s hitting Julie, but when the Starkeeper (Ian Simpson) asks Billy if he is sorry for doing it, Billy tells him, “I ain’t sorry for anything”. When people in the town call Billy a wife-beater, he retorts that he only hit Julie once. Though critics try to make excuses for the attitude toward domestic violence in the play, it is clear that Rodgers and Hammerstein show that a woman’s continued love of her abusive husband or father is the key to his salvation, not any self-awareness or remorse on the husband’s or father’s part. Despite all the glorious music of Rodgers’ score, this fact of the creators’ excusing men who can’t refrain from striking those they “love” poisons the whole experience of the show. The Sound of Music does express the same idea when Liesl sings, “ I need someone (i.e a man) older and wiser / Telling what to do”. That musical, however, provides us with intelligent characters like Maria and Captain von Trapp with whom we can empathize. Carousel does not because the members of the two main couples are portrayed as so stupid. Julie may fall in love with Billy, but how smart is it for her to lose her job deliberately just to talk to him longer? Billy, a self-confessed “puddin’ head”, wins no sympathy when he foolishly gambles away his future gains from theft with a cheater like Jigger. Carrie initially seems brighter than Julie, but her love for the maniacal Enoch Snow who already has a timetable for when she will have each of their children makes us doubt her wisdom and his sanity. We might be able to put up with dim-witted characters and disturbing views of women if the production itself offered some balance in its staging. Unfortunately, director Susan H. Schulman, set designer Douglas Paraschuk and costume designer Dana Osborne do nothing to incorporate a contemporary take on the musical. In fact, the staging looks positively antique with Schulman moving the actors about in decorative groups where they stay put until a dance sequence starts, after which they take their decorative stations again. Paraschuk’s set is in the old style of having left and right side towers be mirror images of each other and Osborne costumes are fully period style even for the supernatural characters. The most spectacular aspect of the design is the revolving carousel that the actors build and dismantle onstage. This would be exciting except that Brian Macdonald did exactly the same thing when he directed Carousel at the Festival Theatre in 1991. Back then the effect was exciting because no one before had ever used a revolve on the Festival stage. Whatever positive impact Paraschuk’s carousel might have is counteracted by the horrible see-through horse he has devised for the Starkeeper to glide in on. It makes us think less of heaven than a kiddie show like My Little Pony Live on Stage. Schulman does use up-to-date technology in having Brad Peterson create a video for the backdrop that changes continually throughout the action. It’s effect, however, is not much different than if Schulman were to use a series of old-fashioned painted backdrops. And Peterson comes up with some hopelessly corny images such as Billy and Julie rowing a boat (over the sand?) in front of a gigantic full moon or having the Starkeeper throw stars that shoot in an arc just like the start of the old TV show Walt Disney's Wonderful World of Color. The effect of the design and of Schulman’s direction is to emphasize that the story is stuck in the past, in an outmoded way of thinking, and is thus irrelevant. opera, but it is so beautifully full and warm that both her famous numbers, “June Is Bustin’ Out All Over” and “You’ll Never Walk Alone” bring down the house. While Michael Lichtefeld’s choreography is uncharacteristically unremarkable, he does beautifully recreate Agnes de Mille’s original twelve-minute-long ballet of Act 2, danced with precision and power by Jacqueline Burtney as Louise and Alex Black as the Carnival Boy. Richard Rodgers himself thought Carousel his best score, and one reason is that there is more music than dialogue, with even the dialogue underscored with music. Besides this, he makes such complex use of Leitmotifs that the musical is not far removed from opera. Indeed, the Lyric Opera of Chicago staged it as an opera earlier this year. The Stratford Festival provides the show with an orchestra of seventeen, larger than that of a modern musical today. The pity is that since the entire show is miked badly, the orchestra never has the lush sound it ought to, frequently sounds tinny in the treble clef, and the blending of the orchestral sound with the voices of the singers is often imperfect. 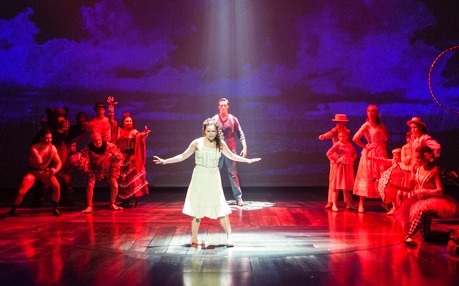 Obviously music theatre fans will want to see Stratford’s Carousel simply because the work despite all its problems is deemed a classic, is staged so rarely and is beautifully sung. For those forced to decide between the two musicals on offer at Stratford, The Sound of Music is the clear winner and is certain the more family-friendly of the two. Shakespeare in The Taming of the Shrew (1593) and Molière in L’École des femmes (1662) have characters espouse negative attitudes towards women and and prescribe the duty they owe men. These works, so much older than Carousel, still seem fresh because Shakespeare and Molière present such remarks in an ironic context. Rodgers and Hammerstein do not do so, and when the production also fails to do so, we are left with the question of why Rodgers expended so much gorgeous music on characters who seem unworthy of it and on a text that supports so offensive a theme. Photos: (from top) Alexis Gordon as Julie and Jonathan Winsby as Billy; Jacqueline Burtney (centre front) as Louise and Alex Black (centre back) as Carnival Boy; Alexis Gordon as Julie and Alana Hibbert as Nettie. ©2015 David Hou.